You can have a pleasant resting spot beneath a shady tree even if space in your garden is limited. Many attractive trees are suitable for the smaller garden, achieving just a few feet in height even when fully grown. A single specimen tree planted in a well-chosen spot make a wonderful focal point for the garden. During summer days, it can also offer natural shelter from the heat of the sun. Some popular trees, such as beech, oak, lime and chestnut, are less suited to the smaller garden because of their mature size. The specimen tree offers a focal point within the garden. Choose a light, open space. Remember that as the tree grows larger, it might cast shade on areas you want to remain sunny. Also, remember that the tree must not be too close to neighbouring gardens. Ensure there is sufficient space around the specimen tree for it to grow freely for many years without pruning. This allows it to develop a well-shaped, natural crown. Many specimen trees provide an ideal place to sit beneath their shady crown. A bench is therefore essential, and you may want to place a table and chairs beneath it as well. It is best to invest in garden furniture of the kind that can left out in all weathers. This will save you the trouble of taking it all indoors during the winter. To enable people to move about the under the crown of the tree, the trunk should be at least 1.8m high before the branches start to spread. This gives an airy sitting area, protected from the summer sun, while birds and other animals will be able to find a home in the crown. The best location for a specimen tree is an open space in the garden. However, if you choose a shallow-rooted tree and plant it in a lawn, the root may harm the grass by depriving it of nutrients and moisture. 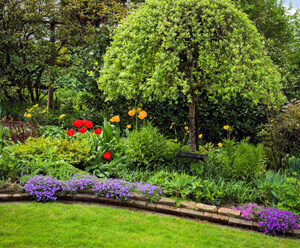 Shade will also tend to harm a lawn, creating difficult conditions for grass to grow and favouring the development of moss and other lawn weeds. To prevent this, you could replace the lawn under the tree, where the garden furniture will go, with a covering of duck boards, stone flags or paving stones. If you do this, leave as large a space as possible between the planks or stones, so water can reach the tree roots. Remember too that there will be exceptional wear and tear on the area under the tree. To alleviate this, mix sand with a clay soil to make it lighter and more easily drained. Plant a tree with a tall stem (at least 180cm). In winter, lop off unwanted branches to encourage growth and develop a sitting area under the tree more quickly. Do not forget to water regularly in the first two years. What is the soil like in the garden? How high is the ground water? Will the branches start reaching into the neighbours’ garden in a few years’ time? Do you want herbaceous plants under the tree? If you are at all uncertain, you should always choose a tree with a small, light crown. Native trees are usually able to survive both cold winters and dry summers. They area also likely to resist disease well. Make your choice on the basis of the features of the tree: flowering, fruit, foliage, and shape of the branches. Once a specimen tree has been planted and is well-rooted, it requires little extra care – apart from the raking of leaves in the autumn. Apart from this, you only need to remove dead or unwanted branches and to watch for pests. The tree will require watering during dry periods and it should also be fed, especially while young.